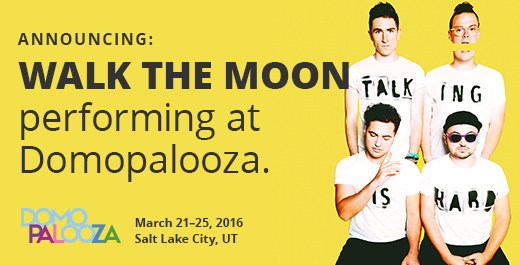 SILICON SLOPES, Utah – February 25, 2016 – Today Domo announced that pop rock band Walk The Moon will entertain at Domopalooza™ 2016. The Cincinnati-based group, which is made up of Nicholas Petricca, Kevin Ray, Sean Waugaman and Eli Maiman, is best known for their dance floor anthem, “Shut Up and Dance,” which reached No. 4 on the Billboard Hot 100 and No. 1 on Billboard’s Rock and Alternative charts. Walk The Moon is signed to RCA Records and was nominated for three American Music Awards in 2015. The band toured with Panic! At the Disco and Weezer, and joins a lineup of other hot artists performing at Domopalooza after-hours, including Nelly, Flo Rida and Tip “T.I.” Harris. Domopalooza, Domo’s annual customer event, is designed to educate, inform and inspire Domo’s fast-growing community of users from the world’s most progressive organizations and most recognizable brands. Domo’s lineup of inspiring speakers includes NBA Hall of Fame athlete and prolific entrepreneur, Earvin “Magic” Johnson, as well as General Stanley McChrystal, best-selling author and former commander of the nation’s premier military counter-terrorism force, Joint Special Operations Command (JSOC). Both keynote speakers will share their insights on leveraging data to make decisions that improve organizational performance. Now in its second year, it is being held March 21-23 in Salt Lake City. Event attendees will gain new insights on how to best leverage Domo, their growing universe of business data and industry best practices to operate more efficiently and effectively to improve business results.